From virus outbreaks to crises in war zones to media training, Doctors Without Borders' comms director navigates complex terrain to ensure care for those in need. "In the 10 years I’ve been here, this has been by far the most challenging year dealing with more complicated, high-profile, dangerous emergencies at one time than I have ever dealt with," says Jason Cone, comms director for Doctors Without Borders (Médecins Sans Frontières) in the US. In mid-September the nonprofit was contending with the Ebola epidemic wreaking havoc in West Africa, as well as emergencies in South Central Africa, South Sudan, Syria, and Myanmar, among others. By October 24, nine people had been treated for Ebola in the US, the most recent being Dr. Craig Spencer who had been working for Doctors Without Borders in Guinea. Cone heads a 14-member team that responds to crises on myriad communication fronts. He has deployed staff to Liberia’s capital Monrovia, one of the areas hit hardest by Ebola, to coordinate interviews on the ground. The New York communications team is supporting the efforts of association leadership and offices closest to affected regions, triaging requests from press around the world, and handling requests for spokespeople and information. "You couldn’t identify any one person as the face of the organization and that’s intentional," says Cone. "How we present the company flows from the experience of the doctors, aid workers, and nurses in the field. They are the face of the group, the ones we put in front of the microphone." 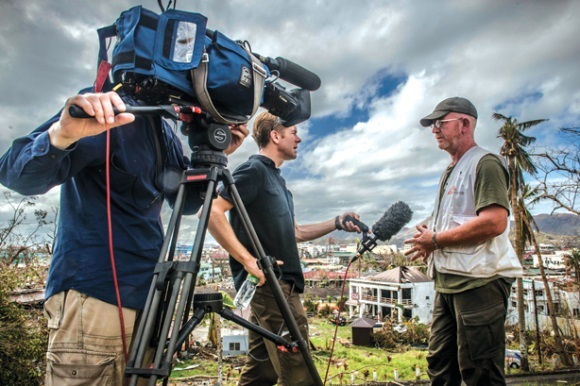 Aid workers are debriefed when they return from a mission and the comms team trains them for media interviews and events. Doctors Without Borders is an associative organization, meaning it is governed by people who work in the field. They also elect the board of directors. US board president Dr. Deane Marchbein joined in 2006 as an anesthesiologist and her work has sent her to hot-button areas including Ivory Coast, Congo, Libya, Afghanistan, South Sudan, and Syria. All efforts at the nonprofit, comms included, are firmly rooted in one driving tenet – Doctors Without Borders is an independent, impartial group that provides care based on need. It operates in risk areas often surrounded by armed groups in conflict with each other, each sponsored by different political or religious interests. "It is tricky to maintain our sense of neutrality in the face of also wanting to expose and draw attention to violence," says Cone. 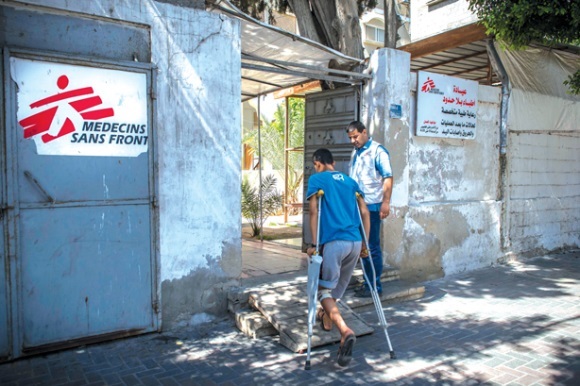 Doctors Without Borders also often finds itself working in very politicized conflicts, Israel and Palestine for example. In that region, it conducted most of its work in Gaza because Israel has one of the best emergency response systems in the world and didn’t need support, says Cone, which resulted in the nonprofit being called out by commentator and lawyer Alan Dershowitz in a piece in The Huffington Post. "That was problematic because we have a huge base of contributors who support both sides," Cone adds. "Our way of working is really the patient in front of us and what is happening to them. We are not a human rights organization. Navigating in those lines can be difficult." The nonprofit responded quickly with a statement from its then-board president Matthew Spitzer in the same media outlet and talked to Dershowitz, providing information based on facts about what happened. "We aggressively dealt with it in a transparent way, but we’re not going to change how we operate," says Cone. "We build our narrative based on what we see in the field." The aid organization’s commitment to transparency was evident in its publishing of a 2011 book, Humanitarian Negotiations Revealed, which pulled back the curtain on some of the compromises it faces in providing care. Examples cited include a $10,000-per-project registration fee to al Qaida-affiliated militia to continue working in Somalia. "We have principles that guide how we work, but we have to make compromises and they vary from one situation to the next," he says. "We make mistakes and are willing to debate them, but we are going to make choices because they have to be made in the moment and not in retrospect." A lot of the work Cone does with the operations team revolves around such issues. Will drawing public attention to a situation put pressure on governments or groups to change policies or result in the nonprofit not getting access to people in need? And while the group works in 70 countries, "We are regularly denied access because we are unwilling to accept the compromises required in terms of the risks to staff, our independence, or ability to provide care," he adds. Doctors Without Borders and VII Photo Agency created Starved for Attention, an Emmy-nominated campaign to demand that donor nations stop supplying nutritionally substandard food to malnourished children around the world. The project included a seven-part series and simulated clinic that toured the US to describe how the nonprofit works to prevent malnutrition. "It was an astonishing project. Jason [Cone] approached us to visualize childhood malnutrition, which was bold and ambitious, and highly motivating given the huge importance of the subject," says Stephen Mayes, CEO at VII Photo Agency. "We made this complex issue into a powerful story with a human face and a compelling call to action." "We increased public awareness and stimulated policy change," he adds. "Jason’s strategy paid off, made possible only because of his calm, but determined, coordination of Doctors Without Borders’ internal resources and VII’s powerful visual motor. Many lives will be changed as a result." Cone has been on the ground in places including South Sudan, Haiti, and Thailand, and recently went to Myanmar. 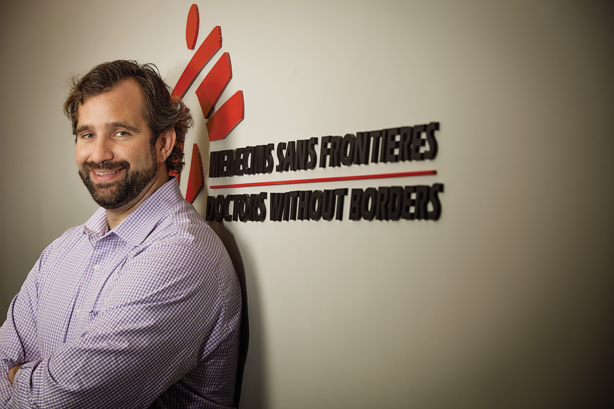 "Jason regularly puts our vision into practice," says Sophie Delaunay, executive director of Doctors Without Borders in the US. "He’s also been active in supporting the groundwork of field operations by readying a pool of comms officers, organizing media training, or engaging in field research." Comms efforts by the team in a situation such as the Ebola crisis both inform and serve as a call to action regarding issues including medical ethics around experimental drugs, mobilizing the right organizations to ensure a global response, getting personal protective equipment to people working in isolation wards, and making sure trade continues to avoid food security issues. The ripple effects of the outbreak must also be addressed. "If you are a pregnant woman in Monrovia today, you have nowhere to turn for help," explains Cone. Navigating political agendas in conflict regions and an Ebola outbreak grab headlines, but throughout the year the comms team produces studies on diseases including HIV and about 150 medical journal articles based on field research. It also conducts events and donor outreach. In 2013 donations were $209 million compared to $189 million in 2012. Individuals on the communications team are also tasked with following the operations teams, whether at headquarters or in the field, on a daily basis. "It really is decentralization in its purest form," says Cone. "Operational teams run the programs in countries and set priorities." A lot of Cone’s role is protecting the brand. The nonprofit will not accept donations from alcohol, tobacco, and firearm companies, the energy-extraction industries, or pharmaceutical companies. The latter because Doctors Without Borders often advocates against pricing and patent issues it feels are an obstacle to access the best medicines. Corporate donations make up only a small percentage of fundraising, most comes through individuals. "We are a pain when it comes to that," he notes. "We want to make sure our partners align with the sacrifices and great risks people make to do the work for us." Most of the companies the organization partners with are less interested in the cause-marketing angle that the group shies away from and more focused on employee engagement. A lot of the nonprofit’s revenue comes from employee giving that is matched by companies such as Microsoft. LG sponsored Doctors Without Borders’ Starved for Attention campaign, a 2010 documentary series about malnutrition and the need to improve the quality of food provided by aid programs to children. The company’s financial support helped underwrite a lot of the expenses and LG TVs were used to run global exhibits. "It was interesting for LG to rethink how it could support something beyond just marketing benefits," says Cone. "That’s not to say the conversation won’t be fraught with challenges, but there are ways to find that meeting of the minds." The nonprofit uses social channels to tell its story, and has leveraged digital platforms to pressure organizations to change policy. It wanted Johnson & Johnson to join a group that would pool patents to make HIV drugs more accessible. They ran an ad on Facebook and tweeted J&J employees, encouraging them to have conversations around the issue. While J&J did not join the pool, other pharma companies did. Doctors Without Borders also felt the Asia-Pacific Trade Agreement would diminish access to medicines and took to Twitter to address the issue with government agencies and representatives. It has also had social media leveraged against it – in one instance at a frightening level. In Myanmar, extremist groups published the addresses of aid workers’ houses and advocated violence against them. "It can reach that level of crisis," Cone explains. "In Syria we weighed in on chemical weapons attacks. We have become an independent validator of information. That case later led to discussions at the government level with the US, Russia, and Syria." But Doctors Without Borders left northwestern Syria when five workers were abducted last January. They were released, the final two in May. After 22 years, the nonprofit left Somalia in mid-2013 in large part because of concerns over the staff safety. When it comes to social media Cone says there’s not a lot of room for nuance, making the need for clarity even greater. "We deal with human negotiation," says Cone. "It’s heavy stuff and a challenge to distill down to that essence without short changing the reflection that has been done by my colleagues to capture all the choices and interests that had to be examined to arrive at conclusions." Despite the advances of social media there are some truths that haven’t changed, he says. "With crisis communications, the same rules apply whether you are a private company or a nonprofit," says Cone. "Do not compromise your values and mission, whether you are selling detergent or trying to respond to an earthquake."